Jocelyn Tager, who has pushed for an ordinance requiring new construction in Watertown to include green energy, looks out at the solar pergola over her driveway. On a trip to Turkey in 2012, Jocelyn Tager was stunned by the sight: Solar panels covered the rooftops of homes everywhere. The Cambridge psychologist, who lives in Watertown, found herself inspired by a simple question. “I thought, ‘If Turkey can do this, why can’t we?’” she recalled. 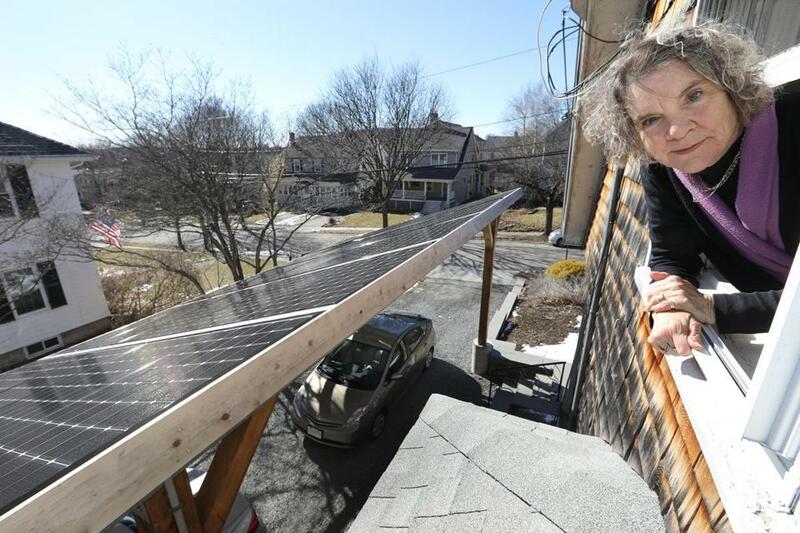 After learning more, Tager launched Neighborhood Solar, a program that lets people and businesses in Watertown and nearby communities obtain group discounts for installing solar panels — including over her own driveway. Now, the Watertown Town Council has followed her lead and passed a groundbreaking zoning ordinance that requires new large commercial and residential developments to have solar panels. Watertown’s ordinance is the first of its kind in New England, according to Vincent Piccirilli, Town Council vice president. But local leaders in other communities around the region also are looking to the sun to help ease dependence on fossil fuels. Norton’s Town Meeting recently approved a zoning change to allow a solar farm to be built over cranberry bogs in town. Amesbury is working with a renewable energy company to build a solar array on a capped municipally owned landfill. And in Newton, city officials are seeking to build solar panels on public buildings and over municipal parking lots. Watertown’s ordinance requires solar panels to be installed at commercial developments of more than 10,000 square feet that require special permits, residential buildings with at least 10 units, and parking structures, Piccirilli said. The rule does not apply to private homes. Eric Wilkinson, director of energy policy for the Environmental League of Massachusetts, said he would like to see more communities pursue solar energy strategies. Some solar proposals have met with controversy, however. City councilors in Newton have approved 15 sites on public property to build solar arrays to meet municipal energy needs. But the city scaled back plans at some locations after residents raised concerns about trees being removed to make room for the installations. A vote on two additional locations — at the Brown Middle School and the Newton Free Library — is scheduled for Monday, March 18, said Ellen Ishkanian, a city spokeswoman. In Hopkinton last fall, the Planning Board turned down a proposed solar project on land located between Cedar and Wilson streets. TJA Clean Energy of New Bedford sought to build a pair of solar arrays on nearly 11 acres of land leased from Southborough developer William Depietri. In denying the special permit, the Planning Board noted that some members raised concerns about the proposed solar facility’s visual impact on nearby homes, as well as the need to preserve Native American ceremonial stone landscapes. TJA Clean Energy appealed the decision to state Land Court, where a judge remanded the case back to the Planning Board. The Hopkinton Planning Board met on March 11 about the project, and continued the hearing to March 25, according to the town’s selectmen’s office. Other efforts have gone more smoothly. In Norton, Town Meeting in January approved a payment-in-lieu-of-taxes agreement with Colorado-based NextSun Energy, which wants to build a solar array over a cranberry bog on Bay Road. Town Meeting also approved new regulations allowing solar facilities by right in Norton. NextSun’s proposal is now being reviewed by town boards, according to Town Manager Michael Yunits. If the project generates 8 megawatts as planned, the PILOT deal would pay Norton $200,000 a year for 20 years, he said. PILOT agreements with operators of three existing solar facilities in Norton bring in about $113,000 annually, including one run by Citizens Energy on a closed town-owned landfill, he said. Citizens Energy also pays about $85,000 in annual rent to the town. A fourth solar farm pays about $45,000 in yearly property taxes, he said. Yunits said Norton has a large amount of land, which may be attractive for companies looking to erect solar farms. He said some residents have expressed concerns over how neighborhoods might be impacted. “It seems like people have been receptive, but obviously the neighbors want the property screenings and protections,” Yunits said. Amesbury is working with Kearsarge Energy of Boston to build a solar array on a capped municipally owned landfill, according to Mayor Ken Gray. A separate solar array was built on a privately owned capped landfill. Amesbury also implemented the state’s Property Assessed Clean Energy program, which gives developers an incentive to build solar installations or make other energy improvements by financing them through a betterment assessment, he said. Tager said her work promoting use of solar technology in Watertown led a member of the Town Council to ask her to draft an early version of the ordinance in 2016. Tager recalled feeling “complete joy” when it was passed. She credits her mother for encouraging her to be environmentally conscious while growing up in the Midwest. Her mother set up their town’s recycling center, and even found a use for flyers that were delivered to their home. “She would cut them up, flip them over so there was no print, and staple the corner, and that would be her notepad,” she said. Tager said she inherited an interest in the environment and sustainability. “I was always interested in having an environment be as healthy as possible,” Tager said. Tager’s work is far from over: She believes other communities have to move away from fossil fuels and encourage use of renewables like solar and wind. She wants Watertown to expand its ordinance to include new construction of all buildings, regardless of use. That would include new single-family homes, as well as two- and three-family residences, she said.